Today is a good mail day! Freshly delivered from Estonia is this brilliant Pavel Sidorenko Re_Vinyl record clock. I love all his designs so much that I pinned one to my Pinterest board but it was the New York clock that I fell in love with. My husband and I have been lucky enough to travel to NY on a couple of our US trips and it's one of our favourite cities. He has two walls of his office dedicated to NY which remind us of all the wonderful things we have done on those visits. This will be a great addition to his collection. You can pick out lots of landmark buildings from the New York skyline and yes, that is King Kong swinging from the top of the Empire State Building! 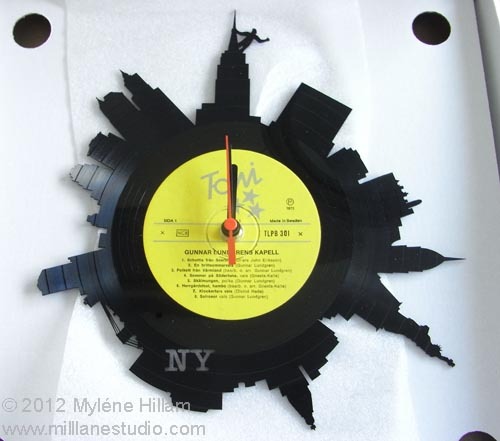 You've just got to check out Pavel's range of clocks - he has designs for many major cities around the world. And yes, for all my Aussie readers, there is one for Sydney! Now I've just got to hide this away for a few months until our Anniversary!